ELLICOTT CITY, Md. 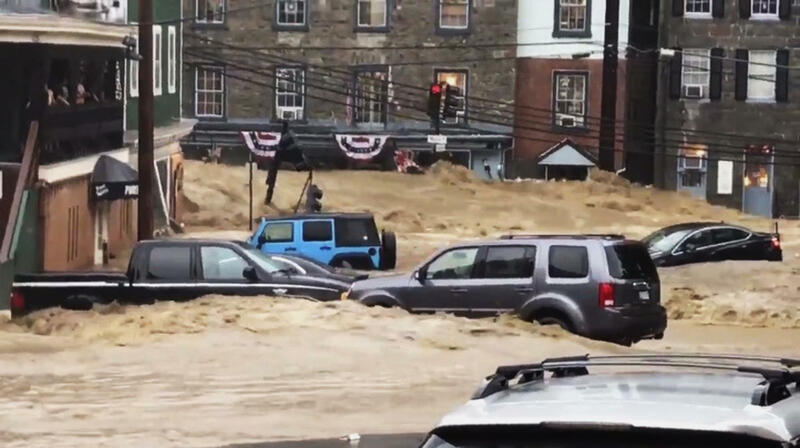 -- Sunday's flash floods in Maryland sent cars floating down Main Street in historic Ellicott City. Maryland local officials said they were heartbroken to see the community so severely damaged again less than two years after a devastating flood killed two people and caused millions in damages. CBS News correspondent Jeff Pegues reports that Howard County officials confirm that there is one person missing. The missing man has been identified as Eddison Hermond, 39, of Severn, Maryland. Eddison Hermond, 39, of Severn was reported missing around 12:30 a.m. Monday. Kenneth Josepha, a close friend of Hermond, told CBS News that Hermond was trying to help a woman locate her pet, but while trying to assist her, he was washed away on Main Street. Howard County Executive Allan Kittleman said Monday morning that his priorities are finding the missing man and assessing the condition of buildings that house shops, restaurants and families. He said emergency workers are "making every effort to locate that individual." Lt. Col. Charles Kohler, a spokesman for the Maryland Army National Guard, said Hermond is a sergeant assigned to the training department at the Camp Frettard Military Reservation in Reisterstown. He said Hermond was not on duty Sunday evening and had not had guard training during the weekend. He said Hermond spent more than 10 years on active duty in the~ U.S. Air Force, starting in 1996. After a break in military service, he joined the Maryland National Guard in 2009. Officials said Monday afternoon that nearly 300 people were rescued. As the floodwaters receded late Sunday, officials were only beginning the grim task of assessing the destruction. During a Sunday evening news conference, Kittleman said authorities aren't aware of any fatalities. But first responders and rescue officials were still going through the muddied, damaged downtown, conducting safety checks and ensuring people evacuated. Kittleman said the damage was significant and appeared to him to be worse than the flooding two summers ago. Residents and business owners, Kittleman said, "are faced with the same daunting task again." "We will be there for them as we were in 2016," he said. Gov. Larry Hogan also toured the area and promised "every bit of assistance we possibly can." The flooding Sunday swept away parked cars in Ellicott City, set along the west bank of Maryland's Patapsco River and about 13 miles west of Baltimore. Mike Muccilli, a meteorologist with the National Weather Service in Sterling, Virginia, said it's too early to make comparisons between the two floods. But he said both were devastating. In July 2016, Ellicott City received 6.6 inches of rain over a two- to three-hour period. On Sunday, the community received nearly 8 inches of rain over a six-hour period, but most of it fell during an intense, three-hour period, Muccilli said. Some people reported hearing a blaring alarm during the flooding. Others said they gathered in the second story of a building to anxiously watch the seething waters. One sight during the flood: a handmade, white flag hung from an upper story of a Main Street building bearing the letters SOS. Ellicott City has been rebuilding since the 2016 flooding damaged and destroyed businesses. Local officials recently said that 96 percent of the businesses were back in operation and more than 20 new businesses had again opened in the Main Street area. Some are already asking questions about whether enough was done after the last flood to prevent a similar catastrophe. Hogan said temporary improvements were in place and more things were in the works to reduce the community's vulnerabilities. But he said big changes take time, and no one expected such a huge flood so soon after 2016.